What will the Yankees do with Alex Rodriguez? At some point they will just have to eat the contract and trade him right? I mean what alternative is there when you have Eric Chavez pinch hit for him? He is owed at least $116 million for the next five years. I don’t understand the people saying Ibanez should have hit for him in the 8th inning tonight? How does that make any sense? The Orioles would’ve intentionally walked Raul Ibanez to face Nick Swisher. So the question really becomes would you rather have A-Rod hit or Swisher? Cano, Granderson and Swisher should be thankful that A-Rod as usual will get all the blame when they have done absolutely nothing. The 2011 MLB playoffs got under way on Friday and there was already a great moment prior to any games having started. The Texas Rangers invited 6-year-old fan Cooper Stone to throw out the Ceremonial First Pitch to his favorite player, Josh Hamilton. If you aren’t aware Cooper’s father Shannon Stone fell to his death at the Ballpark in Arlington earlier this summer. Great work from the Texas Rangers here. Also kudos to the crowd. One of the greatest ever announced his return to return in 2012. Vin Scully will his 63rd season as the broadcaster of the Los Angeles Dodgers. He has had the gig since they played in Brooklyn. This news comes just days after it was reported that the Dodgers were asking season ticket holders to evaluate Vin Scully. A month from today “Moneyball” hits theaters. I have to say that I am looking forward to the movie and will be checking it out. I read the book a while back and thought it was a pretty good read. Yes, I am well aware that the Athletics haven’t even reached the World Series under Beane but he still turned out division winners with a low budget teams. Who knows, if the umpire calls Jeremy Giambi safe on the “flip play” (I still think the play was a tie at worst) maybe the A’s win the World Series that year and vindicate Billy Beane? Is it just me or does it seem like Justin Verlander flirts with a no-hitter every other start? He has one going against my Los Angeles Angels through 7 today. Keep in mind that he already has two career no-hitters. Anyone know what the shortest time frame is between a team getting a no-hitter and then being no-hit themselves? Ervin Santana of the Angels just got one last Wednesday. MLB.com will have live coverage of the 8th and the 9th (if it gets that far). You can watch the video below. Congratulations to Ervin Santana on picking up a no-hitter today against the Cleveland Indians. This was the first official no-hitter for the Angels since 1990 although they did pitch 8 no-hit innings against the Dodgers in 2008 in a 1-0 loss at Dodger Stadium. Once again a terrible call from an umpire is taking the spotlight away from what was otherwise a very good game. 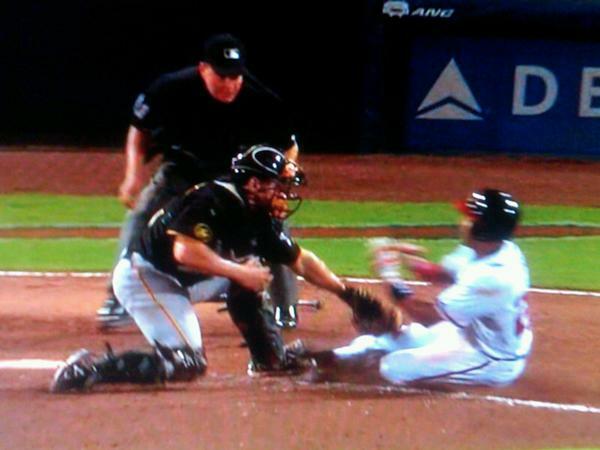 The Atlanta Braves defeated the Pittsburgh Pirates in 19 innings when home plate umpire Jerry Meals blew a call. It appeared as though the tag from Pirates catcher Michael McKenry got Julio Lugo out by 6 feet but for some reason or another Meals called him same. Watch the video and the photo for yourself and decide. After the game Meals explained his call to reporters. I still don’t understand the people who oppose instant replay because they like the “human element.” Just get the call right. That is all it should be about. It is a shame that a game where the two bullpens combined for 26 shutout innings will be remembered for the blown call.